2019-01-16 02:16:09 Margotbean에 의해 마지막으로 편집 됨.
Abigail is a villager who lives at Pierre's General Store in Pelican Town. She is one of the twelve characters available to marry. On Sunny days during Spring/Summer/Fall she'll often be standing on the bridge at the river east of Pierre's General Store. On the 4th of Spring, she has an appointment at the clinic. Note: During rainy days she may not be at the places mentioned below. 9:00 AM Leaves her room to go to the kitchen. 10:30 AM Leaves the kitchen to stand in Pierre's store. 1:00 PM Leaves the house to go to stand on bridge near JojaMart. 1:30 PM Standing on the bridge near JojaMart. 5:20 PM In her room, playing video games. 7:30 PM Goes to bed. 1:00 PM Leaving the house to go to stand on the bridge near JojaMart. 10:00 AM Leaves home to go to Museum. 12:00 PM Inside Museum library looking at books. 6:00 PM Walks to the Graveyard. 7:00 PM Standing in front of Mona's grave. 10:40 PM Arrives at home. 10:30 AM Leaves the kitchen to stand in Pierre's General Store. 1:00 PM Leaves the house to go to stand on the bridge near JojaMart. 9:00 AM Leaving her room to go to the kitchen. 11:00 AM Leaves the kitchen to stand in Pierre's General Store. 3:00 PM Leaving home to go to the Saloon. 3:50 PM In The Stardrop Saloon, sitting on a sofa in the arcade. 1:00 PM Leaving her house to go to stand on the bridge near JojaMart. 1:30 PM Standing on bridge near JojaMart. 10:30 AM Leaves her room to go into Caroline and Pierre's room. 1:00 PM Leaving home to go to the Wizard's Tower. 4:00 PM Near Wizard's Tower in Cindersap Forest. 11:00 AM Leaves home, walks to the Train Platform. 1:00 PM Waiting in front of the Train Platform. 2:00 PM Walks to the lake east of the Carpenter's Shop. 3:00 PM Standing by The Mountain lake east of the Carpenter's Shop. 3:00 PM Standing by lake east of the Carpenter's Shop. 12:00 PM Inside library, looking at books. 6:00 PM Walks to Graveyard. 1:20 PM Waiting in front of the Train Platform. 3:00 PM Leaving home to go to the The Stardrop Saloon. 12:30 PM Leaves her room to go into Caroline and Pierre's room. 1:00 PM Leaves home, walks to the Wizard's Tower. 4:00 PM Standing in front of the Wizard's Tower in Cindersap Forest. 11:00 AM Leaving home to go to The Beach. 1:00 PM Standing at the end of long pier to the left of the Fish Shop. 7:30 PM Arrives home and goes to bed. 1:00 PM Leaving the house to go to stand at Bus Stop. 2:20 PM Standing at bus stop. 6:30 PM In her room, playing video games. 10:30 AM Leaves home to go to library. 3:00 PM Leaving Pierre's General Store to go to The Stardrop Saloon. 4:00 PM Near the Wizard's Tower in Cindersap Forest. 10:30 PM Arrives at home. 10:30 AM Walking to the Carpenter's Shop. Stands next to the counter. 2:30 PM Heads back home and plays video games. 10:00 AM Leaves home to go to the library. 12:00 PM Inside the library, looking at books. 10:30 AM Leaving her room to go to the Carpenter's Shop. 12:50 PM Stands next to the counter near Robin. 11:00 AM Leaves her room to stand in Pierre's General Store. 1:00 PM Goes to the kitchen. 3:00 PM Returns to her room. 2:00 PM Leaving the house to go to The Stardrop Saloon. 2:50 PM In The Stardrop Saloon, sitting on a sofa in the arcade. 9:20 PM Goes to bed. 3:00 PM Goes to The Mountain, standing on the west side of the lake, playing the flute. 8:00 PM Heads home to go to bed. 1:30 PM In the top left consulting room of Harvey's Clinic. 4:00 PM In her room. 9:00 AM In her bed. 10:00 AM Leaves home to go to Sebastian's room. 12:10 PM In Sebastian's room. 5:00 PM Heads home to go to bed. 6:00 AM At home, in the kitchen. 8:30 AM Leaves home to go to Pierre's General Store. 9:30 AM Arrives at Pierre's General Store, stands by the counter near Pierre. 1:00 PM Leaves Pierre's General Store, walking to the Graveyard. 1:40 PM Standing in front of Mona's grave. 5:00 PM Leaves the Graveyard, heading to The Stardrop Saloon. 5:30 PM Arrives at The Stardrop Saloon, heads to the arcade. 5:40 PM Begins playing Journey of the Prairie King. 8:30 PM Stops playing Journey of the Prairie King, starts walking home. 10:00 PM At home in bed. 8:30 AM Heads to Pierre's General Store and stands in the kitchen. 11:00 AM Walking to The Mountain. 11:40 PM West side of the mountain lake. 3:00 PM Walking to The Stardrop Saloon. 5:30 PM In The Stardrop Saloon, sitting on a sofa in the arcade. Abigail lives with her parents, Pierre and Caroline, in the apartment behind her father's shop. Her mother will comment that she is concerned about Abigail's interests and hobbies. Abigail is friends with Sam and Sebastian, and will dance with Sebastian at the Flower Dance if the player doesn't ask her to dance. You can give 애비게일 up to two gifts per week (plus one on 그녀의 생일), which will raise or lower 그녀의 너와의 우정. Gifts on 그녀의 생일 (가을 13) will have 8× effect and show a unique dialogue. Enter Pierre's General Store when Abigail is there, any day except Saturday. You enter Abigail's room and watch her get angry about a videogame. She asks for your help, and you play the console version of Journey of the Prairie King together. (This is just like the arcade version in The Stardrop Saloon, except that Abigail plays a second character and actively helps you, note that she will die a few times which depletes your life too, so remember to pick up those extra lives.) When you finish the level, she thanks you and the cutscene ends. If you fail, however, she will still thank you for trying. Visit the mountain between noon and 7pm on a rainy day, any season except Winter. You see Abigail playing her flute. She asks what you're doing out in the rain. Regardless of your response, she invites you to stand under the tree with her. You pull out a harp and you play a duet as the camera pans out over the lake. Abigail is in the graveyard. She tells you that she's been practicing with her sword because she wants to go on adventures. She asks if you've ever used a sword. Pierre arrives and interrupts to say that Caroline wants her to come help cook dinner. Abigail gets angry, saying they only expect her to help cook because she's a girl. She flees, calling for you to follow. You both hide in some bushes and talk. After receiving a letter from Abigail, enter Pierre's General Store between 8pm and 10pm when she's there. Abigail sends you a letter (signed "Abby") inviting you to visit her in her room. When you arrive, Abigail shows you her spirit board. It reveals a message that indicates she's starting to develop feelings for you. She gets embarrassed and rushes you out of her room. The next day she visits you in the morning and apologizes. After you give Abigail a Bouquet, enter the mines between 5pm and midnight. The event won't trigger if you've already married her. Abigail is preparing to go down the ladder into the mine when she's startled by a bat flying up into her face. She laughs it off and looks back down the hole. Hundreds more bats fly up and she's terrified, running to cower in the corner of the cave. You rush in to comfort her. She tells you that maybe she isn't as tough as she thought. She confesses that she likes you as more than a friend, and asks you to stay with her there. She kisses you. If your character is a girl, she will also state that she didn't know she liked other girls until she met you. After viewing Abigail's 10-heart event, she will appear in The Mines on level 20 on days when it is raining. She will not appear in a Multiplayer game, only in single-player mode. The first time the player encounters Abigail in the Mines, she has unique dialogue. Thereafter, there is a 15% chance to find her playing the flute, and an 85% chance of finding her walking in place. If she is not playing the flute, she will speak to the player. Once married, Abigail will move into the farmhouse. Like other marriage candidates, she will add her own room to the right of the bedroom. She'll also set up a small area behind the farmhouse where she'll sometimes go to practice her flute. On rainy days, Abigail may offer you Solar Essence, Bat Wing, Void Essence, Amethyst, or Fire Quartz. On rainy nights, she may offer you soup: Parsnip Soup, Tom Kha Soup, Trout Soup, Chowder, or Lobster Bisque. 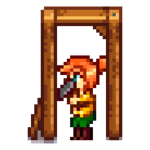 On days when Abigail stays inside the farmhouse all day, she may offer you a Cherry Bomb, a Bomb, Fried Mushroom, or Crab Cakes to assist with your adventuring in the mines. 애비게일 may randomly request an item at the "Help Wanted" board outside Pierre's General Store. The reward is 3x the item's base value and 150 Friendship points. Abigail's look evolved over the years the game was in development. Here's a timeline showing how ConcernedApe's art and Abigail's style changed over the years before the game was launched. When Abigail was first revealed during early development she was depicted with dyed blue hair. This was later changed to purple. "Abigail" is a female given name of Hebrew origin, meaning "my father's joy." Abigail wishes she had a cat but her Dad is allergic to pretty much everything. Giving her something she likes will result in her implying that she is going to eat the gift, regardless of what it is. This includes quartz, an item that ranks at a seven on the Mohs hardness scale - this is tougher than iron, but not as tough as hardened steel. Despite playing the flute, she hates being given the Bone Flute as a gift. Abigail has a pet guinea pig named "David." When Abigail moves in with the player, another guinea pig named "David Jr." will be present in her farmhouse room, while "David" stays behind in her original room at Pierre's Seed Shop. Despite loving Blackberry Cobbler, she dislikes blackberries. After a sufficient relationship is built up, Pierre will confess that he worries that Abigail is not his biological daughter. Later, the Wizard will mention that he has reason to believe one of the townsfolk is his daughter. At one point Caroline will mention that she used to take secret walks to the Wizard’s tower. Abigail also has purple hair, like the Wizard, though Caroline says that Abigail had chestnut brown hair before she dyed it. Caroline wonders where she could have gotten her interest in the occult from (wizard?). Abigail has a poster of Crono hanging above her TV; Crono is a character from the Super Nintendo game "Chrono Trigger." Abigail's video game console looks like a Super Nintendo. If Abigail is neglected (not receiving any gifts or kisses from the player) for a period of time after marriage, she will wonder if she should have married Sebastian instead of the player. Abigail's 4-heart cutscene shows that The Player knows how to play a harp. Abigail mentions that the player owns an electric blanket, if married to her. If married, Abigail mentions that she can't remember the last time she dyed her hair and that it never fades from its current color. During the 2-heart cutscene, if The Player dies, already moving before The Player and Abigail respawn, it could happen that both players spawn into each other, therefore getting stuck and not being able to move. This, however, does not seem to be a bad thing, since you are basically a one-man army, shooting twice the speed in multiple directions. 1.1: Added flute practice area behind farmhouse if married. 1.3: Added appearance in the mines after viewing 10-heart event. Added group 10-heart event. 이 문서는 2019년 1월 16일 (수) 02:16에 마지막으로 바뀌었습니다.